See our newest edition to the aquaponics system...butterflies! 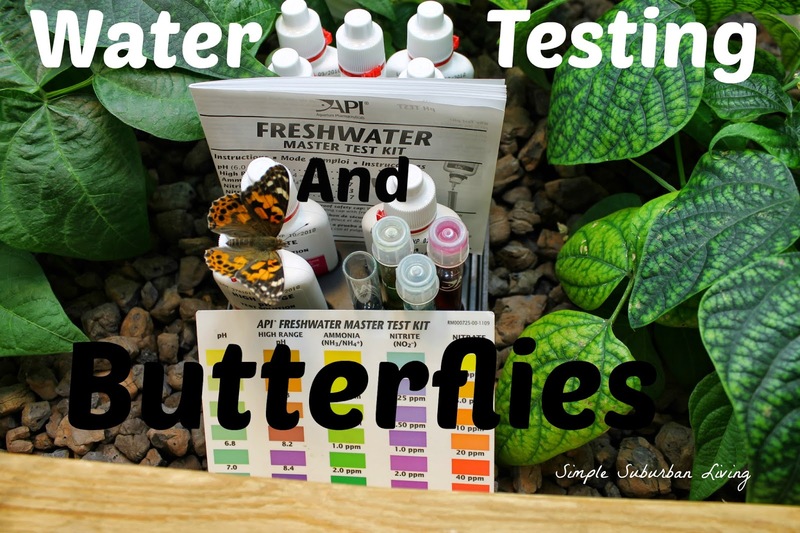 In this episode I am also going through a standard water test using the API Fresh Water Master Test Kit. Water testing is a very important part of starting and maintaining any aquaponics system. This is especially important to do more frequently when you are first cycling the system to determine when it is safe to add fish. Since Ammonia and Nitrites are very toxic to fish it is important to make sure that the bacteria colonies established in your system are able to keep up with converting these toxic compounds into more harmless Nitrates. And, of course, this is the nitrogen fertilizer that your plants need to succeed (more aquaponics rhymes coming soon). I have been using the API Test Kit for over a year now and I have been very happy with it. I did a review and walkthrough on the use of the test kit last year and am still just as happy. It is very easy to use and gives pretty accurate results for all of the tests within 5 minutes. The only complaint I have (and this goes for any of these color based tests) is that some of the colors are very close and hard to distinguish apart. However, in most cases we are only looking for a general idea of levels in the system with the exception of pH. For the best pH results I would recommend picking up an electronic pH reader, however they are a bit more expensive. The kids wanted some live butterflies for Christmas and so we decided we would give it a try and see what happens. We have done the live butterfly thing in the past and the kids loved it; so what could it hurt? They were able to watch their little caterpillars grow from tiny little worm looking things to some pretty awesome butterflies in about 3 weeks. Only problem now was, where do we release these new buddies of ours in the middle of winter? Well we figured since we have an indoor garden, they would probably fit in down there for the time and if they survive until spring they can be moved outside. In the meantime we are just hoping they do not get too comfortable and decide to start a new family of plants-destroying caterpillars! We will keep you updated on this as it develops but for now the kids, my wife, and I(I have to admit) like to come down to the basement garden and check in on our butterfly friends. Until next time, thanks for stopping by! Hi, I see in your video's you have on Michigan State shirts, are you in Michigan? The reason why I ask, GO Blue! is that we are in Michigan and will be putting together our Aquaponics Greenhouse this spring. Actually waiting for poly greenhouse to be finished and shipped to us in the next two months. Husband and I would like to connect up with other Aquponics people who are more "local". Hi! Yes, we are in southeastern Michigan and looking forward to seeing this bitter cold winter come to an end :) How exciting for you, we would love to add a greenhouse to our backyard as well. Whereabouts are you located? Would love to connect with you as well! Water testing is a very important part of starting and maintaining. To keep water clean and fresh Pond Liner Repair Kit plays very important role.